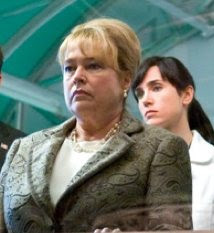 This two-strand pearl necklace was inspired by the pearl necklace that Kathy Bates wore in her role as the Secretary of Defense in the movie The Day the Earth Stood Still. I wished I was able to see the necklace more clearly so I could reproduce it more accurately. 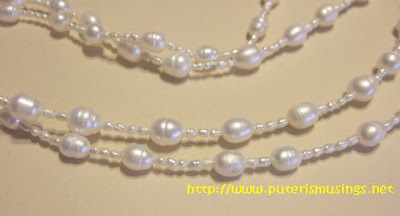 Anyway, I thought my version of the two-strand pearl necklace does not look too bad, at all! What do you think? 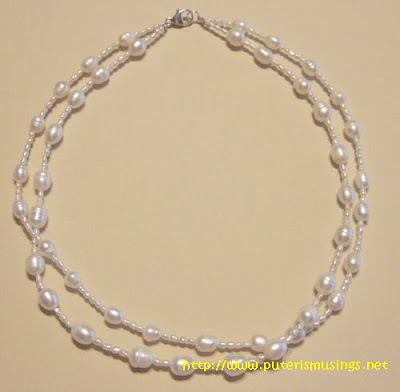 This necklace is wholly made of real fresh water pearls. The findings used are sterling silver. I love pearls and they are very versatile especially now that they come in all sorts of shapes, sizes and colors. They go very well with natural stones, glass beads and swarovski crystals. Great work...looks great indeed. Keep it up. Did it take long for u to make one? J.T., thanks for the compliment!